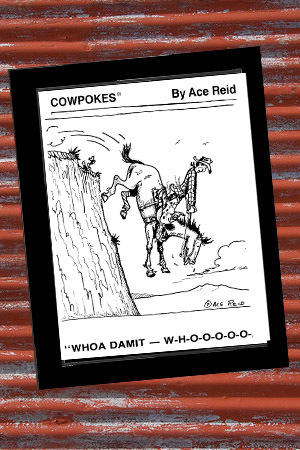 Cartoon of the Month is a matted 8″ x 10″ Cowpokes Cartoon print by Ace Reid ready for your frame. Each month a new cartoon is featured and is available to order for $40.00 per print. Order the May 2018 Cowpokes Cartoon of the Month today! See what the cowpokes are up to each month; it’s always something for laughs, grins and chuckles. If you have a favorite cartoon from the past you may order a print which comes matted and ready for framing, just let us know; contact us!